We are excited to work with EDUonGo to deliver high-quality content to teachers in a ready-to-go course format. In an effort to help teachers access and deliver free online resources, including open educational resources (OER), award-winning eLearning platform, EDUonGo, has partnered with EdGate Correlation Services, the leading provider of educational standards and correlation services. By integrating the EDUonGo platform with resources from EdGate’s Curriculum Matrix®, teachers will be able to access and deliver organized free educational content, including OER resources to K-12 students. The Curriculum Matrix® gives teachers access to a collection of more than 500,000 grade-specific vetted web-based resources, all of which are aligned to Common Core and state standards. EDUonGo will supply teachers the tools they need to customize resources and deliver them to students through an online learning environment. 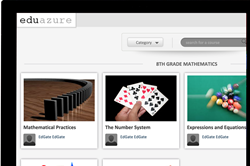 Moreover, in order to save time for teachers, EdGate and EDUonGO have organized the resources into course collections for subjects such as Algebra, Biology, Economics, Research, Writing and more. The product will be offered at a yearly subscription fee and made available to individual teachers and whole school districts. If you are interested in trying the beta version, please visit http://eduongo.com/oer for more information. Founded in 1997 in Gig Harbor, WA, EdGate Correlation Services is the industry-leading correlation service provider. EdGate works with over 250 publishers using their patented technology and highly skilled staff to deliver correlation consulting, licensing of international educational standards, and robust metadata tools. EdGate also offers the Curriculum Matrix®, a repository of thousands of web-based resources that have been aligned to educational standards. For more information, please visit http://correlation.edgate.com. EdGate Correlation Services is a division of San-Diego based EDmin, Inc. EDmin is dedicated to helping educators meet the needs of individual learners and working with their partners to improve student outcomes. EDmin’s flagship product, the INFORM® Learning System, is a learner-centric solution for maximizing student potential. INFORM’s customizable progress indicators help educational leaders align an entire organization to their unique plan for student success. For more information, please visit http://www.edmin.com. EDUonGo enables anyone to share knowledge through an online learning environment. Schools, institutions and individuals partner with EDUonGo to host online academies through its cloud-based platform. In addition to providing features found in leading learning management systems, EDUonGo gives users the flexibility to customize the system and integrate third party tools. For more information, visit http://www.EDUonGo.com.